British Whig statesman. Twice Prime Minister (1834 and 1835-41). ALS. 1p. Brocket Hall Wellwyn, Herts. January 6th, 1814. To Mr. Anderson. 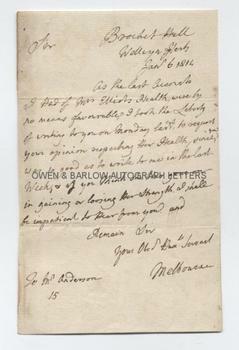 "As the last accounts I had of Mrs Elliot's health were by no means favourable, I took the liberty of writing to you on Monday last to request your opinion respecting her health, since you were so good as to write to me last week, and if you think she has gone on in gaining or losing her strength, I shall be impatient to hear from you." 8vo. Approx 7.25 x 4.5 inches. Old glue stain to left edge of blank verso. Very good. Presumably the lady after whose health Melbourne is enquiring is the wife of William Elliot M.P., with whom Melbourne shared the parliamentary constituency of Peterborough in 1816. Between 1812 and 1816, the seat had been shared by Elliot and George Ponsonby, a relative of Melbourne's wife, Lady Caroline Lamb nee Ponsonby.